143. 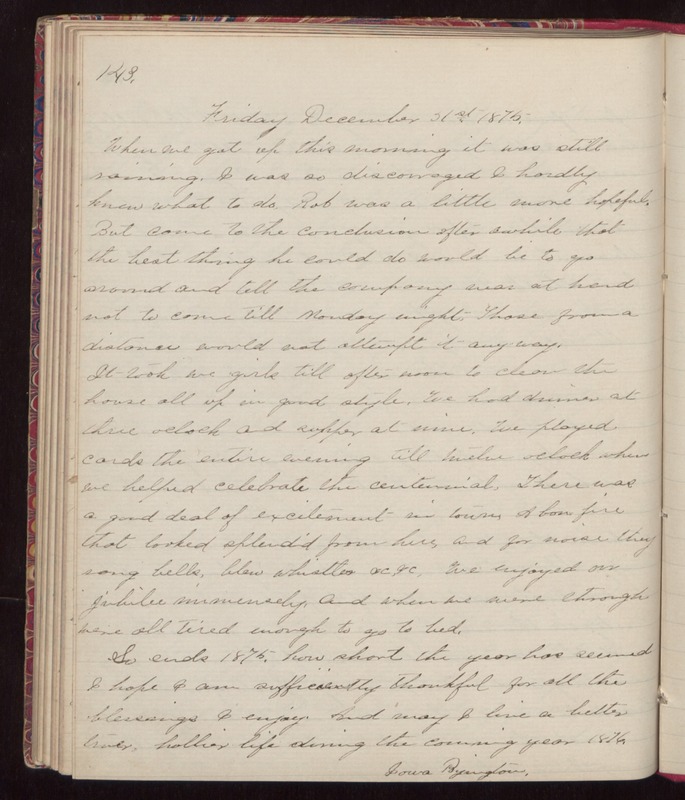 Friday December 31st 1875. When we got up this morning it was still raining. I was so discouraged I hardly knew what to do. Rob was a little more hopeful. But come to the conclusion after awhile that the best thing he could do would be to go around and tell the company was at hand not to come till Monday night. Those from a distance would not attempt it anyway. It took we girls till after noon to clean the house all up in good style. We had dinner at three oclock and supper at nine. We played cards the entire evening till twelve oclock when we helped celebrate the centennial. There was a good deal of excitement in town. A bon fire that looked splendid from here, and for noise they rang bells, blew whistles &c, &c. We enjoyed our jubilee immensely, and when we were through were all tired enough to go to bed. So ends 1875. how short the year has seemed I hope I am sufficiently thankful for all the blessing I enjoy. And may I live a better, true, hollier life during the coming year 1876. Iowa Byington.